This beauty had just opened up when I returned from a family funeral in Virginia on Monday afternoon. What a beautiful thing to see after a sad weekend. My husband told me it was still closed at 7:30 in the morning when he left for work. By 3:30 pm it had opened up to greet me. 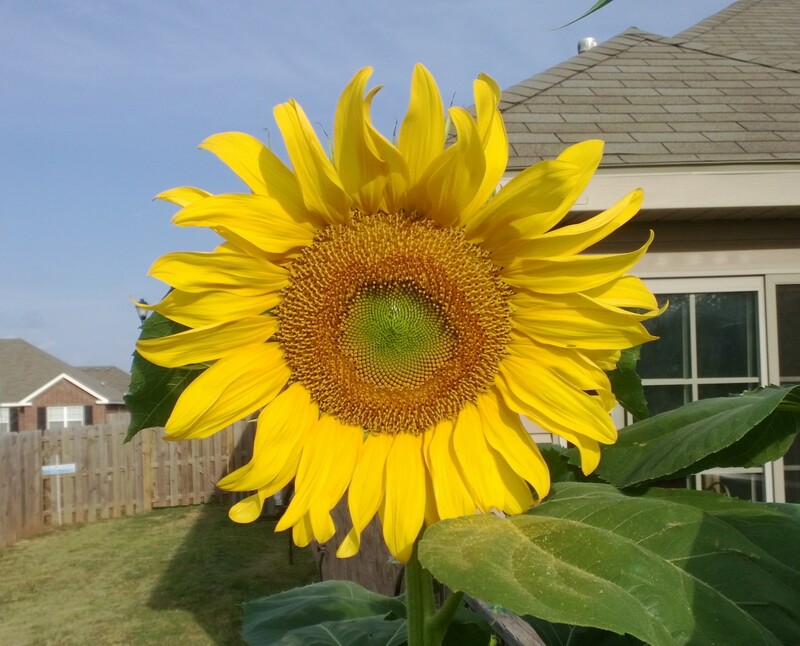 I now have two huge sunflowers that have bloomed, and another on the way. I have never planted sunflowers before. They are incredibly easy and fast growing. You can see their growth from day-to-day. Can’t wait until I can harvest the seeds, but will enjoy their sunny faces in the meantime. Another perk – today there are about 10 bumblebees flying around the sunflowers, and about the same number of small butterflies in the garden. I have not seen a bumblebee in the three years we’ve been here. One of the mistakes I made in planting the sunflowers was planting them on the east end of the garden. My garden is just a small strip garden that runs east to west, so the sunflowers block some of the morning sun. But by 10 am the everything is flooded with sunlight, except the tomatoes, which are right next to the sunflowers. My garden, after what seemed to be a very slow start, suddenly took off and has been growing like wildflowers. It has been a long time since I planted a garden, and had forgotten how cucumbers spread and can take over the space! They are even trying to take over the deck. I have to keep tying them up to keep them from overwhelming everything. I have some small green beans and cucumbers growing. One tomato plant has just sent out a branch of buds that will soon be tomatoes, I hope. Apparently, they are getting enough sun. This entry was posted in Arkansas, Gardening. Bookmark the permalink.